It’s the holidays and the beach is calling your name! Plus, if you’re feeling bad about not working out on these lazier days, you can always opt for the sand instead of the health club. 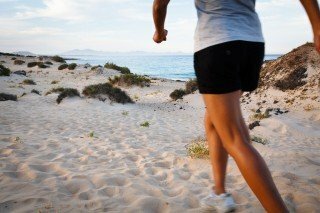 In fact, occasionally transferring some of your workouts from your gym to the shore could give your body a stronger session while you enjoy a refreshing change of scenery. Place two towels about 15-20 metres apart and sprint from one to the other. Do five sprints there and back (10 in total), focusing on maintaining your speed. Get into a plank position on the dry sand and crawl forward using your forearms and toes, keeping your core engaged. Try to crawl for 60 seconds. You don’t have to catch any waves to get a strong surfer bod. All you need is 8 rounds of surfer get-ups. Start in a low plank position with your hands on the sand at shoulder height. Hoist yourself up and into a squat with one foot in front of the other, as if you were standing on a surfboard. Take advantage of all the open space you have at the beach with a set of walking lunges. Step forward on one foot and bend so that your other knee touches the sand. Do six on each side. Here’s one that will ensure you fit right in with all the other beach goers. Standing upright, hold your towel with a corner in each hand. Lift your arms and wave your towel in fast, firm movements for 30 seconds. Once you’ve got your workout in, cool off with a dip in the water and soak up some sun guilt-free!